(Bloomberg) -- It’s inevitable. 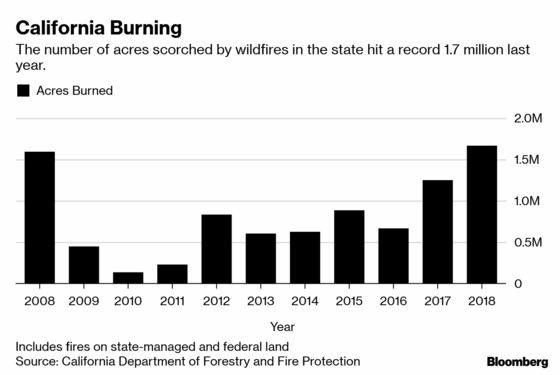 Every year, big swaths of California will burn. The question now that spring is here is how bad it will be. If recent history is any guide, this year’s wildfire season could be grim, despite a new push by state officials to keep flames at bay. For all of its lush redwood forests and snow-capped peaks, most of the Golden State is semi-arid, with rain falling during only half of the year. And a shifting climate has been delivering ever hotter summer weather. True enough, the winter that just ended was unusually cool and wet. But that’s not good news, because it is likely triggering an explosion of spring plant growth, as thirsty grasses, shrubs and trees make the most of the bounty. Once temperatures rise, new leaves and flowers will turn into fuel. This pattern was a reason the last two years were so disastrous. More than 140 lives were claimed and millions of acres scarred. 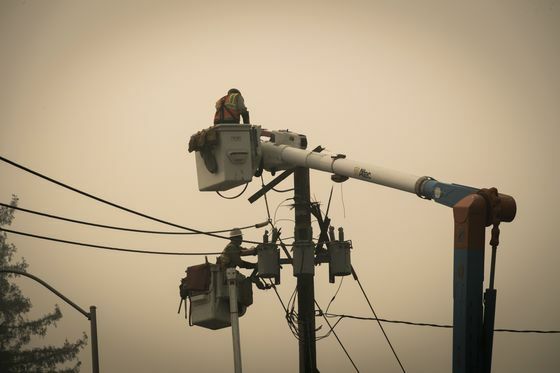 Utility giant PG&E Corp., its power lines blamed by state investigators for sparking some of the blazes, plunged into bankruptcy. Governor Gavin Newsom on Friday declared an emergency to speed up prevention work, including removing some of the estimated 147 million trees killed by an historic drought that ended in early 2017. “The increasing wildfire risks we face as a state mean we simply can’t wait until a fire starts in order to start deploying emergency resources,” he said. The hope is for a cooler-than-normal spring and summer, keeping vegetation moist longer, delaying the onset of the annual infernos before the rains return in October or November. But so far, the long-range forecast for May through August calls for warmer-than-average temperatures, according to Michael Anderson, state climatologist with the California Department of Water Resources. Witness what happened last year, when stifling heat gripped Northern California throughout June. The 38,000-acre Klamathon Fire erupted just south of the Oregon border on July 5. It kicked off a month of burning that culminated with the 229,651-acre Carr Fire, which began near Redding on July 23 and killed eight people. In the past, blazes of that size typically didn’t strike until late August or September. “We started seeing large fires from the get-go -- there was no warm up,” said Scott McLean, a spokesman for the California Department of Forestry and Fire Protection, called Cal Fire, which has accelerated the clearing of brush and removal of dead trees across the state. The Camp Fire, the deadliest and most destructive wildfire on record in California, started on Nov. 8, weeks after the rains usually return. Possibly sparked by a PG&E power line, it killed 85 people. Although Cal Fire’s investigators haven’t cited the cause, PG&E has said it is “probable” its equipment will be identified as an ignition source. Investigators have already said PG&E equipment sparked a series of deadly wildfires that tore across Northern California in 2017. More than 3,000 people who lost homes or loved ones in those blazes have sued the company. Investors fled the stock after the Camp Fire broke out. The utility filed for bankruptcy reorganization in January, facing at least $30 billion in potential wildfire liabilities. The emergency Newsom declared is intended to speed up a process set in motion the day after he took office in January, when he signed an executive order giving Cal Fire 45 days to draft a report detailing short- and long-term steps to lessen fire risks. The agency identified 35 high-priority projects that could be tackled immediately, such as creating defensible spaces around vulnerable communities and clearing out forest undergrowth. PG&E and other utilities are beefing up their mitigation programs. By 2025, Edison International’s Southern California Edison utility will install 5,500 miles of lines coated with insulation to prevent ignition, replacing bare wires in high fire-risk areas, according to a plan the utility filed with state regulators in February; at least 96 miles will be installed this year. PG&E will remove more than twice as many trees near its lines -- about 375,000 -- as it did last year, according to its plan. The company will step up inspections of its utility poles and towers, protect 150 miles of power lines with coated wires and non-wooden poles and install 400 weather stations to monitor conditions. State law requires residents of fire-prone areas to clear brush and dead grasses within 100 feet of their homes, but they often don’t comply. 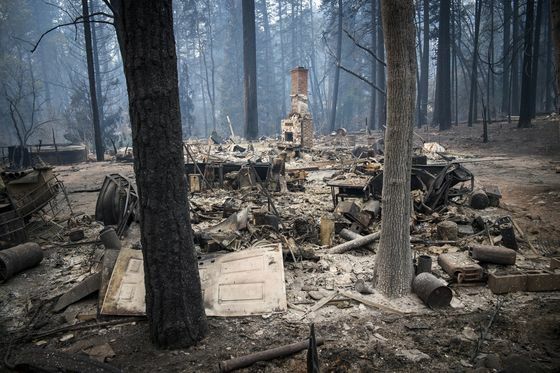 State Senator Bill Dodd, who represents parts of the wine country devastated by the 2017 fires, has introduced legislation to direct the state fire marshal to draft a model ordinance for cities and counties to help them with enforcement. That’s one step of many that can be taken. But in the end, it’s down to the weather. “Timing is everything,” said Anderson, the state climatologist. “When you get those really strong heatwaves in May and June, you dry out the foliage and the extreme conditions stick around longer.” And then the burning starts.